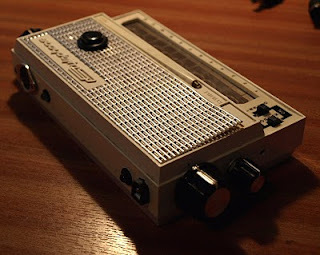 A few months ago I used an Arduino clone board to send MIDI messages out of a Stylophone. 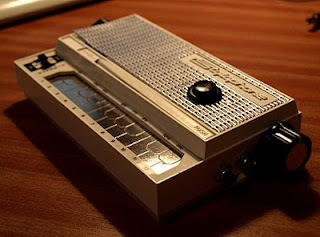 I always intended to take it to the next level and get another Stylophone (preferably a broken one) and rip out the guts to fit all the electronics inside, and also add a few buttons and pots for perfomance controllers. Well, I finally got round to it. This time I am using a PIC16F688 microcontroller.. this little monkey only has 14 pins and costs a mere £1 yet it has a built in clock, serial port and ADC, which means its pretty much the *only* component needed in this project (with the exception of a couple of resistors and switches). I added a pitchbend pot, a modwheel and a pot to control the note velocity. And pushbuttons to shift octaves and “hold” a MIDI note (basically force the code to forget to send note-off message so the last note rings on after lifting the stylus). This allows a kind of polyphonic drone out of the usually strictly monophonic stylophone. #define NO_NOTE   0x7f // means stylus "off keyboard"
// Where program starts running! // a new press on the button can be registered. // handles possibility of "switch bounce"
// do we need to kill the previous note?